A clip from President Eisenhower’s Farewell Address. Seeing a great military hero, as he finished two terms as chief of state, deliver a message like this, is powerful. The President chose his words carefully, and he did not mince them. I think we should take that advice. There are grave implications for the very structure of our society. The potential for a disastrous rise of misplaced power persists. Take nothing for granted. ONLY an alert and knowledgeable citizenry can COMPEL the proper meshing. Without an alert an knowledgeable citizenry, liberty is jepoardized by the economic, political and spiritual influence of the military industrial complex. But for my entire childhood, I assumed that someday I would. I think military service has always been particulary respected in the rural South. And I was fascinated by military history and all things martial. My best friend (and sometimes Billsblog reader) ended up getting appointed to the Naval Academy, and went on to a distinguished career. I didn’t want to go to a service academy (and probably couldn’t have gotten an appointment even if I had wanted one), but intended to do ROTC instead. I didn’t have any money for college, so I applied for and received Army and Navy scholarships. But at almost literally the last minute I turned them down. I was looking forward to student life, and I just didn’t want to wear the uniform yet (this was 1978 after all). So I declined the scholarships, but fully intended to go to Officer Candidate School once I graduated.I had gotten some other smaller scholarships and UVa helped me land a job at the JAG school. Together with some loans, it was sufficient to enable me to cover the costs (while still feeling impoverished). During my fourth year of undergraduate school I took the LSAT. I didn’t really want to be a lawyer, but I didn’t want to leave Charlottesville yet. I did well on the test and sent in an application to UVa, the only law school to which I applied. I was admitted, and thus could postpone growing up for three more years. I borrowed and worked my way through law school. As graduation approached I was facing what seemed like an overwhelming mountain of debt (although it was a small fraction of what it would be today). It seemed logical to me that I take a job at a law firm to get the debt paid off. So I decided to join the National Guard, instead of the Army. I wanted to be a Ranger, but the Virginia National Guard told me that if I had a law degree I’d have to go into the JAG corps, and I didn’t want to do that. So I thought about joining the Florida National Guard, but that year they were in the news a lot fighting hurricanes and quelling riots in Liberty City. Neither job appealed to me. But in 1978 if you had asked me to rank my likely future occupations, from most likely to least likely, I would have had “Army officer” ranked number one. “Farmer” would have been near dead last on my last. It’s a very busy time of year, and likely it won’t be possible for me to keep blogging every day. I’ve been creating a week of posts at a time, then posting them once a day during the week. But it looks like I’m going to run out of time for that too. So if you see a break, just check back from time to time. I set this blog up through Network Solutions (which hosts our website). We really don’t need the website anymore, so I may shut it down at some point and migrate my blog over to Word Press (or somewhere else). Or maybe I’ll come to my senses and stop blogging. I keep doing it because I kinda enjoy it, and in the hope that someone might get something meaningful out of it. Network Solutions gives me “site stats” that tell me how many folks viewed the blog, how long they stayed on, whether they accessed it from their “favorites” tab, if they found it by searching and if so for what term, and things like that. It does not give me any information to enable me to know who visited the blog. I’m getting about 350 regular visitors (down from over 600 last summer). A high pecentage are coming over from their favorites tab. There’s certainly no prospect of national syndication with numbers like that, but I do think it’s pretty cool that so many folks are visiting. But since hardly anyone leaves comments, I really don’t know what draws y’all here. So, time permitting, I’ll keep posting the same sort of stuff I always have. But maybe not everyday. Industrial agriculture depends upon nitrogen fertilizer to produce the stuff it passes off as food. Without it, industrial agribusiness would be unable to extract much of anything from the depleted soils in uses for its monocultures. There simply isn’t sufficient fertility in the soils. Only by massive applications of synthetic fertilizers does the machine function. I wonder how many Americans realize that over half the nitrogen fertilizer used in this county is imported, or that over 20% of the imported nitrogen fertilizer comes from Russia. The primary source of the nitrogen used to produce nitrogen fertilizer is natural gas. 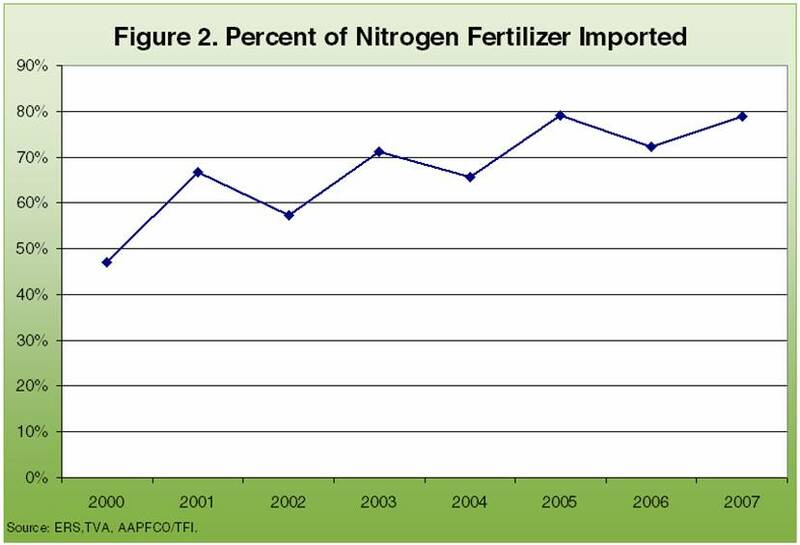 In the 1980s the U.S. was the world’s largest exporter of nitrogen fertilizer. Now the U.S. is the world’s largest importer, due primarily to increased consumption of natural gas in the U.S. While most of our imported nitrogen comes from Trinidad and Tobago, we are also dependent upon Russia, Latvia, Venezuela, the Ukraine and Saudi Arabia. It goes without saying that such a model of agriculture is unreasonable and unsustainable. So I’ll hop back up on my soapbox and encourage everyone to buy your food from local farmers who fertilize naturally.